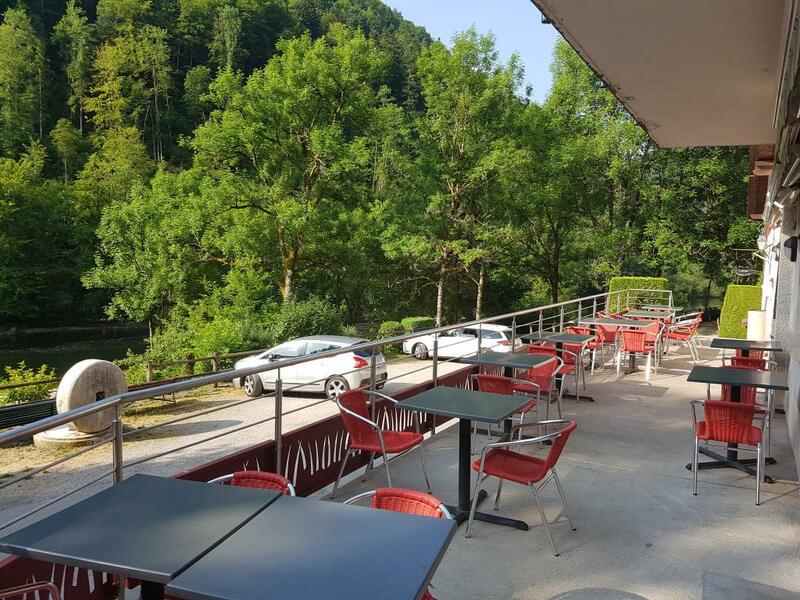 The Moulin du Plain has always been well-known for its restaurant which offers a choice of dishes made of local market products, traditional or creative, but always with a regional touch. Enjoy a delicious meal in a charming place. Our restaurant is well-known for over 50 years for its local cooking : morel mushrooms and toasts, fresh trouts, local smoked ham on the bone, … This tasty regional cooking has been renewed by the introduction of creative dishes always with a « regional touch » and made of fresh products changing as the seasons go by. If the weather allows it, you may appreciate to have lunch or diner on our terrace with a view over the river and the valley. Inside, our dining rooms and little veranda offer a cosy atsmosphere for a romantic diner, a meal with your family or with some friends. Our smaller dining room is in an old wood panelled style with a cheminey. The largest dining room with its panoramic windows can accommodate up to 60 persons. You may enjoy our traditional dishes present on our menu since 1961 like morel mushrooms and toasts, fresh trouts from the tank cooked “meuniere”, “au bleu” or smoked, or local ham smoked in a traditional way, a regional must. Or maybe you will try a home made foie gras, a beef samosa with its local cheese and Jura yellow wine sauce, a fried ball of garlic and parsley butter with snails, or a nice steak of bison raised in the fields a few kms away from the hotel.